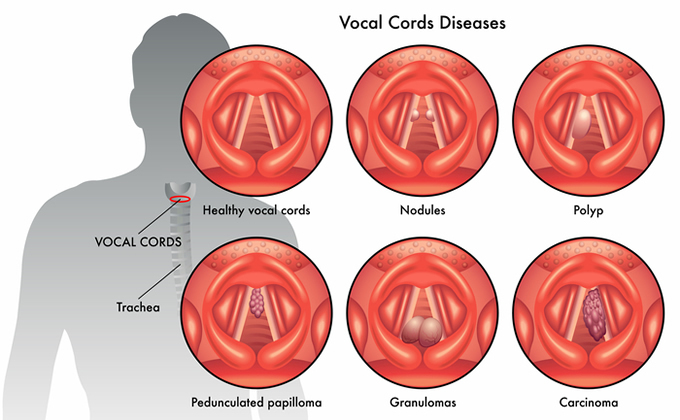 A vocal cord nodule is a benign (non-cancerous) vocal cord growth that is often the result of overuse or misuse. The nodules are very similar to callouses that form within the vocal cords. Nodules typically occur on both vocal cords. Vocal cord nodules are often diagnosed during a thorough examination of the throat. This may involve a laryngoscopy or a stroboscopy. A laryngoscopy can be performed with the use of a small camera placed through the mouth or nose in order to view the vocal cord. A stroboscopy uses a specialized light that is timed to the vibration of the vocal cords in order to analyze them. Treatment frequently includes voice therapy. During voice therapy, a speech pathologist will teach the patient to use their voice properly and avoid actions that may result in the development of nodules. Many patients see positive results with voice therapy and an appropriate period of rest to allow the nodules to naturally go away. For some individuals, voice changes linger despite voice therapy. Occasionally, surgery, performed through the mouth, takes place to remove the nodules from the vocal cords. Common preventative measures include avoiding the extreme use of the voice, such as excessive screaming or prolonged periods of loud speaking. Practicing proper breathing techniques and knowing when to take a rest can also minimize the risk of developing nodules. While often associated with singing, vocal cord nodules are also common in younger children who have a tendency to speak in a consistently loud voice. Nodules may also develop in individuals who either speak professionally or use their voice for other demanding tasks. Ignoring signs of nodules may lead to serious damage to the vocal cords and other throat issues.